In addition to manufacturers' warranties, Cleanosonic.com provides a 30 day satisfaction guaranty. If any ultrasonic jewelry cleaner fails to meet your expectations simply return it to us with a copy of your invoice or order confirmation email. We will be happy to replace it or give you a full refund, less shipping. If you cannot locate your paperwork, give us a call. We'll look you up in our system and send you a copy. 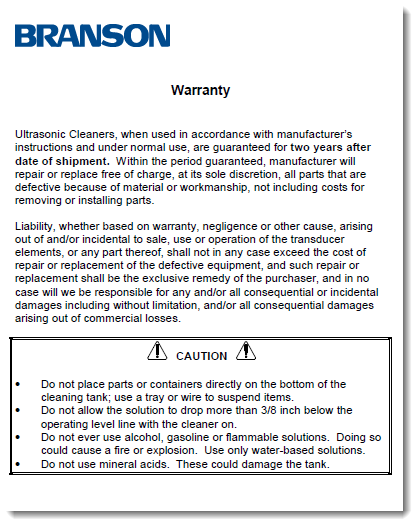 Ultrasonic Jewelry cleaners also have a 2 year replacement warranty. If your machine malfunctions during the first two years after purchase, we will send you a replacement unit of equal or greater value. Cleanosonic offers a 30 day D.O.A. 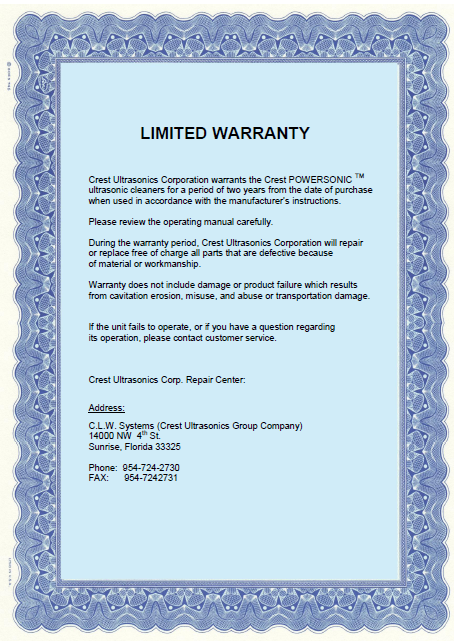 Warranty on all Bransonic B Series and Crest ultrasonic machines. If your unit fails during the first 30 days after purchase, we will replace it with a new machine. Simply call us for an RMA number. We will provide you with a UPS acct number to cover shipping costs. NOTE: Cavitation erosion is a normal phenomenon, similar to wear on tire treads. Bransonics units ( and most any ultrasonic tank ) operate for many years before it becomes an issue. WA Brown warranties Bransonics and Crest machines against cavitation erosion for two years.